New York City, May 30, 2018 – The New School is proud to announce that the Platform Cooperativism Consortium, founded and directed by Trebor Scholz, Associate Professor of Culture and Media at Eugene Lang College, has received a Google.org grant for pioneering work on Platform Cooperativism. The grant supports the economic development of cooperatives in the digital economy. It focuses specifically on creating a critical analysis of the digital economy, and designing open source tools that will support platform co-ops working in sectors such as child care, elder care, home services, and recycling​ in the United States, Brazil, Australia, Germany, and India. Platform co-ops are websites or apps that are owned and democratically governed by workers and/or users. This initiative will be led by Trebor Scholz --founder of the Platform Cooperativism Consortium (PCC) at The New School-- in collaboration with the Inclusive Design Research Center (IDRC) at OCAD University, headed by Jutta Treviranus. Planning for this project has taken place throughout the 2017/2018 academic year, and work will begin in July 2018. “This grant is a big win for the cooperative movement and for platform co-op pioneers all over the world," says Trebor Scholz. "This Kit will make it easier to start and run platform co-ops. 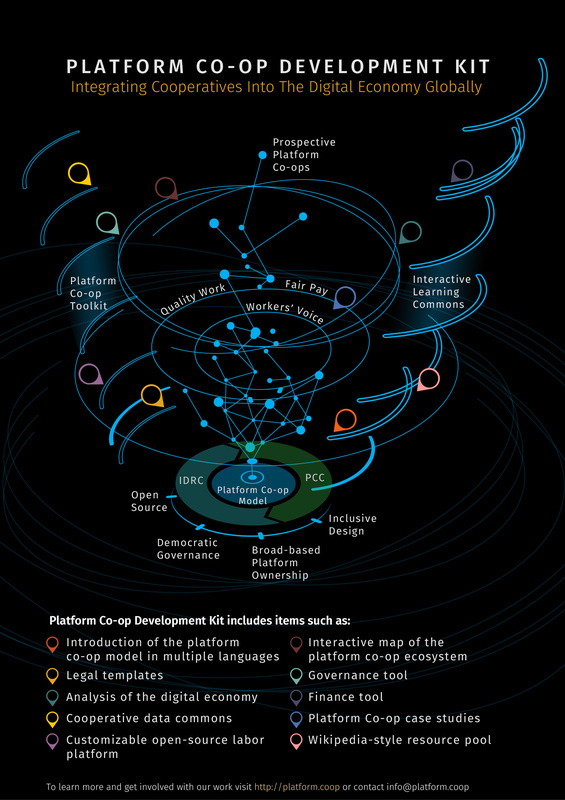 It will also provide an interactive map of the co-op ecosystem and essential community-edited resources. Google.org has provided funding to develop the Kit, which will combine the research of the PCC and the practical knowledge of the thriving platform co-op community with the inclusive design and development strengths of the IDRC. But to build out this critically important and timely project into further territories and sectors, additional funding will be needed." The grant will also allow Scholz and the Consortium to engage other leading organizations committed to creating jobs with fair pay and good working conditions for diverse populations working in the digital economy. By applying the cooperative model to digital labor, the Platform Co-op Development Kit offers a compelling alternative to the otherwise extractive and on-demand digital economy. Workers, policymakers, industry leaders and cooperative experts from across the globe also expressed their support of the project and the grant. "The Platform Co-op Development Kit connects the economic advantages of co-ops with genuine innovation in the digital economy. The project could change the lives of many people in Brazil for the better. The Brazilian cooperative numbers counts with more than 6.600 coops with 13 million members and 375 thousands direct jobs. The entire movement can be benefited by the Platform Co-op Development Kit."